More than half of the marine dealers who responded to a recent survey expect to see growth in the coming year, versus just 14 percent who expect a decline, with 35 percent predicting sales will grow between 1 and 3 percent. 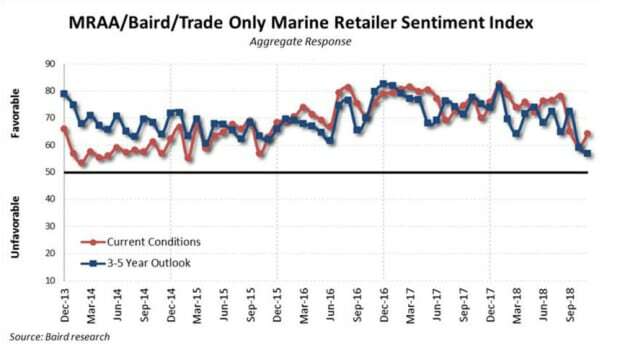 Almost 20 percent thought the year would be flat with 2018 sales, according to a survey done in conjunction with Baird, the Marine Retailers Association of the Americas, and Soundings Trade Only; 16 percent thought it would be up another 3 to 5 percent, and 15 percent predicted it would rise 5 percent or more. Respondents continued to complain about the poor quality of boats they are receiving from manufacturers. Several also echoed the struggle to find and retain qualified service technicians, with one citing “staff turnover” as an example of what is not working. Weather and political action or inaction were cited as having the most negative business impacts. Retailers seem to be increasingly concerned about tariffs, interest-rate hikes, stock market volatility and the overall political climate. Those concerns might have factored into a drop in long-term dealer optimism for the third consecutive month to a new low of 57 (50 is considered a neutral rating); retailer sentiment on current conditions rose to 64 from 60 in October. Almost half of the dealers said they thought new-boat inventories were too high, versus 6 percent who felt they were too low. Many said that they were concerned about carrying too much. “Manufacturers want you to overload on inventory, not supply it at a fair price when you need it,” said one dealer. Though some expressed apprehension about rising prices of new smaller boats, others said new technology — often the culprit for rising prices — was helping sell boats. Dealers listed manufacturer promotions as examples of things that were both working and not working. Substantial promotions helped spark sales during the slow season for some, but others said their manufacturers were either not offering promotions or they were not substantial enough to help move the sales needle.